Pilot Officer W V Crawford-Compton of No 485 (New Zealand) Squadron RAF, sitting in the cockpit of his Supermarine Spitfire Mark VB, "Samson", at Kenley, Surrey. At the time this photograph was taken, Crawford-Compton had shot down 3 enemy aircraft. He joined No. 611 Squadron RAF as a flight commander in August 1942, and in December 1942 was given the command of No. 64 Squadron RAF, which he led until July 1943. After promotion to Wing Commander Flying at Hornchurch he lectured on tactics in the USA, returning to operations in April 1944 in command of No. 145 (Free French) Wing of the 2nd Tactical Air Force. His final total was 21.5 victories and, having been awarded the DSO and Bar and DFC and Bar, he became the most highly-decorated New Zealand fighter pilot of the war. Spitfire Mark VBs of No. 64 Squadron RAF in revetments at Hornchurch, Essex. The nearest aircraft, (probably) BM476 SH-Z Atchashikar, was flown by the Squadrons Commanding Officer, Squadron Leader W G G D Smith. A Supermarine Spitfire Mark IX of No 64 Squadron, Royal Air Force undergoing an engine overhaul just outside a blister hangar on the north side of Fairlop airfield in Essex. The aircraft had been pushed outside the hangar for the photograph. A Supermarine Spitfire Mk IX of No 64 Squadron RAF, the first unit of Fighter Command to be equipped with the type, taxying before take-off at Fairlop, Essex, 2 November 1942. A few words from a fellow pilot before the engine-start of Supermarine Spitfire Mark IX, BR600 `SH-V', of No 64 Squadron, Royal Air Force at Fairlop airfield in Essex. Spitfire Mk I P9450 in flight, April 1940. Pilot of No. 64 Squadron RAF running towards his Supermarine Spitfire Mark 1A as the Squadron is scrambled at Kenley, 10.45 am, 15 August 1940. Flight Lieutenant J A Plagis and Flying Officer A J Hancock of No. 64 Squadron RAF, standing in front of a Supermarine Spitfire Mark V at Hornchurch, Essex. They had, between them, shot down 16 enemy aircraft in the air battles over Malta in 1941 and 1942. Spitfire Mark VC, AA873 Manchester Air Cadet, at the Aeroplane and Armament Experimental Establishment at Boscombe Down, Wiltshire, shortly before conversion to a Mark IX. It subsequently served with No. 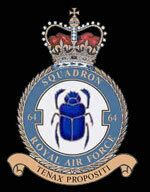 64 Squadron RAF. This image is part of a sequence of five photographs taken on 7 May 1942 at Hornchurch, and later released by the Ministry of Information to illustrate a typical offensive operation. In the bright spring sunshine, a No 64 Squadron Spitfire VB is readied for another sortie. Photo 01: Another of Rolf von Pebal's photographs taken from one of the low flying Do-l7s of 9./KG76 during the 18 August attack on Kenley in which the airfield was seriously damaged. In this view, a Spitfire of 64Sqn is seen parked unattended and exposed to attack in a blast pen on the northern edge of the airfield perimeter. Spitfire Mk Ia P9554 flown by Plt Off James O'Meara of No 64 Sqn, Kenley, August 1940. While flying P9554 on 12 and 15 August 1940 O'Meara destroyed three enemy planes, two Bf 109E's and a Ju 88 and further damaged three He 111s. By the end of the war he had achieved 11 and 2 shared destroyed, 1 unconfirmed destroyed. 4 probably destroyed, 11 damaged and 1 shared damaged. On 16 August the CO of No 64 Sqn Donald McDonald (9 destroyed, 1 shared destroyed, 3 unconfirmed destroyed, 1 probably destroyed and 7 damaged) flew this aircraft and claimed one Bf 109E destroyed another as a probable and a third as damaged and also claiming a shared destruction of a He 111 and another one damaged over Kent. When on his way back to Hawkinge McDonald was jumped by a 109 and was forced to bail out of P9554.